I have found that the most meaningful gifts are those that are unique and one of a kind, and selected with great care. For your consideration are some beautiful items that are available for immediate shipment from the Quatrefoil Design store. I am very excited to announce a new offering in the Quatrefoil Design store, available right now! Artist Melissa Tubbs, well known for her exquisitely detailed original ink drawings, has created a series of four finely rendered bird drawings for the store. These are original drawings - one of a kind - and are all signed by the artist. I have custom framed them in a high quality, hand painted black frame, which sets off the drawings to perfection. 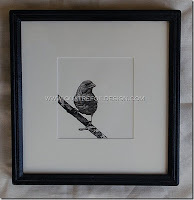 The bird drawings are sold individually, and would look lovely as part of a collection on a gallery wall, and would look equally exquisite as a set. They are so amazingly detailed, and are truly works of art! Also available for immediate shipment are a beautiful series of antique French documents that date from the late 1700s to the late 1800s. These are original and one of a kind, and are custom framed in a beautiful wood frame hand gilded in our signature ‘gilver’ finish (silver with a translucent gold glaze). These are sold as a set. Click here for the store item: http://www.quatrefoildesign.bigcartel.com/product/18th-and-19th-century-antique-french-documents-framed. We also have the exquisite original gestural drawings by Tina Steele Lindsey. One is framed and ready for immediate shipment (the others can be framed to the customer’s specification). The framed gestural drawing can be found on the store here: http://www.quatrefoildesign.bigcartel.com/product/gestural-figure-drawing-3-by-tina-steele-lindsey. Please check the art section for the other renderings. We also have a few architectural renderings that are framed and ready for shipment. Finally, we have a few original paintings by Nancy B. Westfall available – the crab and lobster series. As always, framed intaglios can be ordered, however they will not be ready for Christmas. To visit my store, Quatrefoil Design, click here. Ooh...her work is so very beautiful!!! Your items are so beautiful and well made. I love framed intaglios and get compliments all the time!! Lovely new items!! They are all spectacular. Still loving the colorful lobsters though. I imagine them in a fun beach cottage. I'm all over these! Thanks for sharing.